When people think of art, what often comes to mind is literature, paintings, drawings, sculpture and even film. Yet, one of the greatest things I’ve learned over the past few decades is the ability of art to transcend the bounds of common definition, and settle itself into the far expanse of everything we experience as humans – and feel affection for. Though Oriental, Persian and Turkish rugs have long been considered art by many who appreciate the passion and dedication involved in their production, people seldom consider those who painstakingly assemble these masterpieces. Today we explore these artists, these weavers who dedicate their lives to creating what can only be considered true works of art, and provide some insight on the love they have for their handmade craft. Wool being thoroughly cleansed in preparation for dyeing. The artistry found in Oriental rugs often begins much differently than other handmade arts, as many weavers who craft these finished pieces tend to participate in the entire process of their production, including the sourcing and refining of a carpet’s materials. From selecting, cleaning and dyeing wool and silk, to spinning these materials into long strands of yarn in order to prepare them for weaving, rug artisans typically become experts in every facet of their craft from start to finish. Dyed wool is gathered prior to creating a rug or textile. In many parts of the world where Oriental rugs are made, whole communities participate in the process. It’s not uncommon for some portions of the group or tribe to raise the sheep that will provide a carpet’s wool, while others contribute to dyeing and twisting it into yarn, and then the artists themselves design and assemble the finished rug. This is also true for families of a particular area – each of them supporting the artistry which likely supports them financially. Mother and daughter working together on a rug in Uzbekistan. Cultures around the world celebrate rug weaving as a tradition handed down from one generation to another, with each generation aiming to become an even greater artisan than the one before. One of the defining characteristics you will find in antique rugs coming from particular communities or families is the use of certain motifs that carry on from grandfather to father to son, or conversely, from grandmother to mother to daughter. It is this kind of tradition that binds many who work within the Oriental and Persian rug making craft, and especially as the market has widened for sale of these works of art, the ability of these artists to have their culture, talent and familial traditions exhibited the world over. A man selling finished textiles. The history of Oriental, Persian and Turkish rugs goes back for millennia, and can be found in very early historical texts and scriptures. 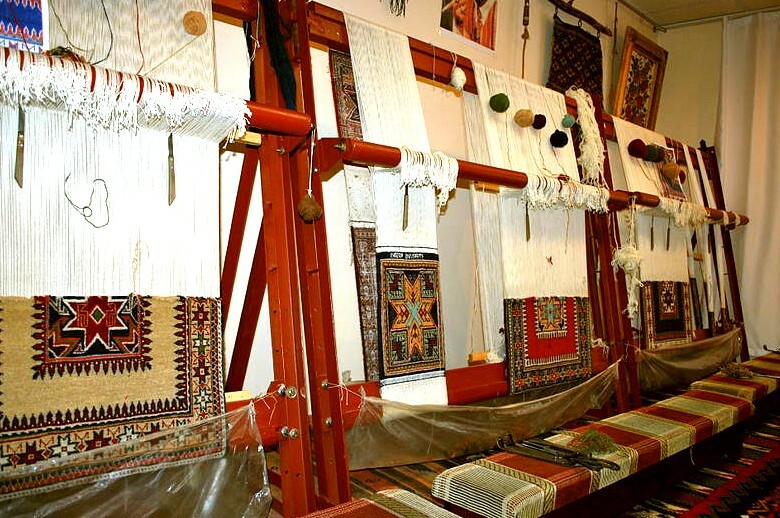 Handmade rugs and tapestries themselves can be found in paintings and etchings far back into the medieval period and beyond, though many of the actual articles have not survived to modern day. Nevertheless, what’s most impressive about the art is how it has largely gone unaltered in the past century in much of the world. While machine-made rugs are now being manufactured in numerous countries, the true artistry of Oriental rug weaving has not been lost, and nor will it any time soon. It’s because of these weavers, whose profound adoration for the practice and art of weaving rugs knows only the limits of their imagination, that we can count on them being produced for many centuries to come.